Getting from one NAIA terminal 1 to Terminal 3 averages 25 minutes by taxi (if you can get a taxi right away.) This is expected to be shortened to 8 minutes once under-construction NAIA Expressway project is completed to link Sales Interchange (SLEx) to Coastal Road and the PAGCOR Entertainment City complex and even Skyway to Makati and eventually to NLEx Balintawak if Skyway Stage 3 is completed next year. 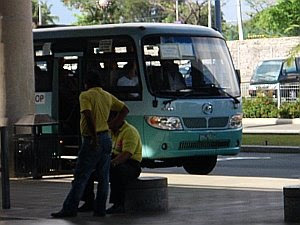 From NAIA Terminal 1, you can ride public utility buses from the road in front of the terminal building. the bus will pass by Baclaran, MRT taft Avenue Station and LRT EDSA Station onwards to Magallanes (mantrade), Pasay Road, Ayala Avenue, Sen. Gil Puyat Avenue (Buendia), Guadalupe, Boni/Pioneer St., Shaw Boulevard, SM Megamall, Ortigas Avenue, Robinsons Galleria, Ortigas Center, Cubao and onwards to its destination. The NAIA Airport shuttle bus has plain white color without markings. How do we know that it is the Airport Shuttle bus or it is the Criminals bus? The problem of Filipino Airport planners are not customer oriented. There must be an identification in the bus written NAIA Airport Shuttle bus and the direction to Terminal 2 or 3 etc. This is still the old ways 20years ago, that our Airport is the most dangeraous airport in the world.